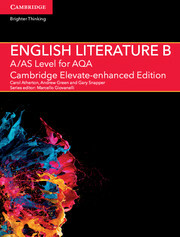 Endorsed for the AQA A/AS Level English Literature B specifications for first teaching from 2015, this print Student Book is suitable for all abilities, providing stretch opportunities for the more able and additional scaffolding for those who need it. Helping bridge the gap between GCSE and A Level, the unique three-part structure focuses on texts within a particular time period and supports students in interpreting texts and reflecting on how writers make meaning. 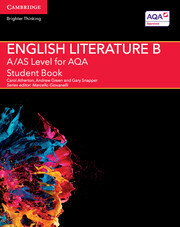 An enhanced digital version and free Teacher’s Resource are also available. Easy to navigate, differences between AS and A content information clearly explained. 9.1 What is literary theory? Gary is a former Head of English who now teaches A Level and IB English Literature at Cheney School in Oxford, he also leads workshops for teachers and trainee teachers around the UK on sixth form teaching. He is the editor of the National Association of the Teaching of English (NATE) professional journal Teaching English, and co-authored a teaching English Literature book with Carol Atherton and Andrew Green. Following his doctoral research, he continues to work as a Research Associate at Brunel University. He has written extensively for a number of audiences in journal articles and book chapters on post-16 English, and is on the post-16 committees of NATE and the English Association.